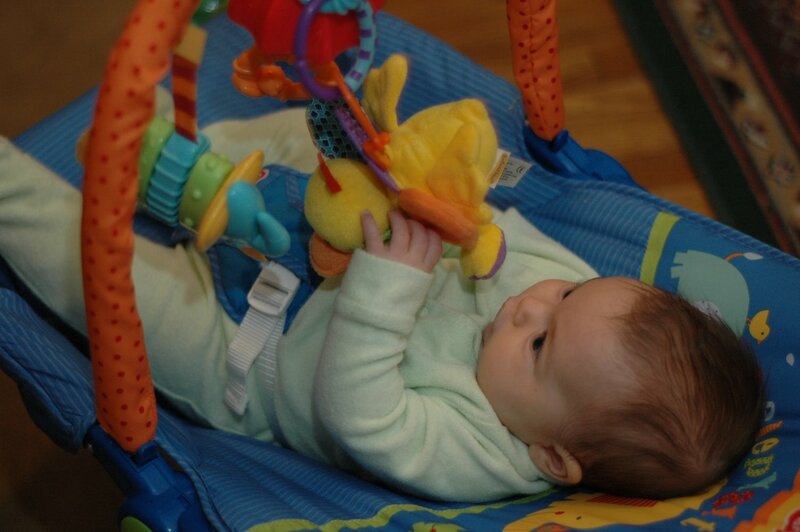 The FisherPrice Calming Vibrations rocker was given to me for Amara at a baby shower. It wasn’t something that I had registered for, but I was assured by the giver that my baby would love it. I must admit, she was right. We were able to begin using the rocker soon after Amara was born as it has a safety buckle that’s very adjustable. 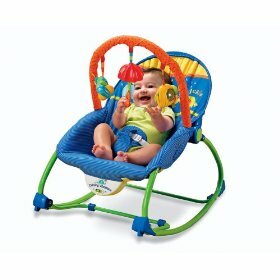 The position is also adjustable, allowing you two positions: reclining and sitting up. It can be used as either a rocker or set to be stationary by simply moving a bar out at the bottom of the rocker. I’ve also used it as a children’s rocking chair with my 2.5-year-old cousin and she got quite the kick out of it, pulling it around with her and demanding to use it all day. It runs with a few batteries, and we’ve not had to replace them through over 6 months of regular use. This is a good thing as batteries can get to be expensive. You can choose to turn the vibrating portion of the rocker off at any time though, as there’s a switch on the front for this. 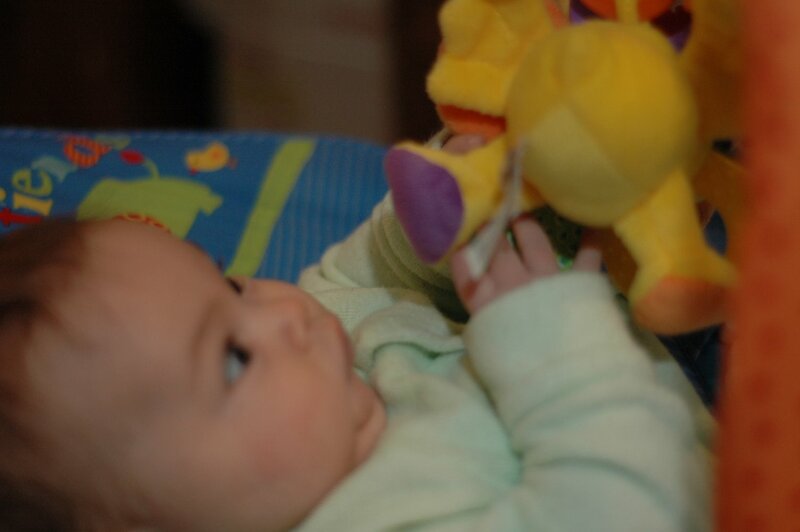 Amara especially enjoys the middle toy that hangs down, since it sings a little tune of “5 little ducks” when pulled. It’s the only piece that isn’t removable–the other two are held on by velcro and can be replaced by another velcro object if you wish. While this is a nice feature, it would be nice if there were rings or something instead that I could attach things with. The entire toy “bar” can be removed very easily. The pros of this seat would be the versatility of a child’s size that can use it, the weight (light), the sturdiness (my daughter can’t tip it over no matter how hard she tries), and the many options it offers (toys, vibrations, positioning). Cons would be the toy removal issue as well as the song, as it can get annoying time and time again, and the fact that there are some plastics and synthetic materials involved in the making of this product. These are small annoyances in comparison to the hours of enjoyment and ease of transferability that the Calming Vibrations rocker offers, though, so I can definitely recommend this to my readers!